Yorkshire Sculpture Park01924 832631work Art GalleryYorkshire Sculpture Park (YSP) is the leading international centre for modern and contemporary sculpture. It is an independent charitable trust and registered museum situated in the 500-acre, 18th-century Bretton Hall estate in West Yorkshire. sculpture park in the UK, and is the largest of its kind in Europe, providing the only place in the world to see Barbara Hepworth’s The Family of Man in its entirety alongside a significant collection of sculpture, including bronzes by Henry Moore, and site-specific works by Andy Goldsworthy, David Nash and James Turrell. 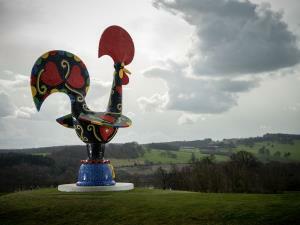 YSP also mounts a world-class, year-round temporary exhibitions programme including some of the world’s leading artists across five indoor galleries and the open air. Recent highlights include exhibitions by KAWS, Bill Viola, Anthony Caro, Fiona Banner, Ai Weiwei, Yinka Shonibare MBE, Joan Miró and Jaume Plensa. Yorkshire Sculpture Park (YSP) is the leading international centre for modern and contemporary sculpture. It is an independent charitable trust and registered museum situated in the 500-acre, 18th-century Bretton Hall estate in West Yorkshire. YSP was named Art Fund Museum of the Year in 2014. For Car Parking fees please see full details below. Please pay for parking any time during your visit. You will be asked to type in your car registration number. The system takes both cash and card.